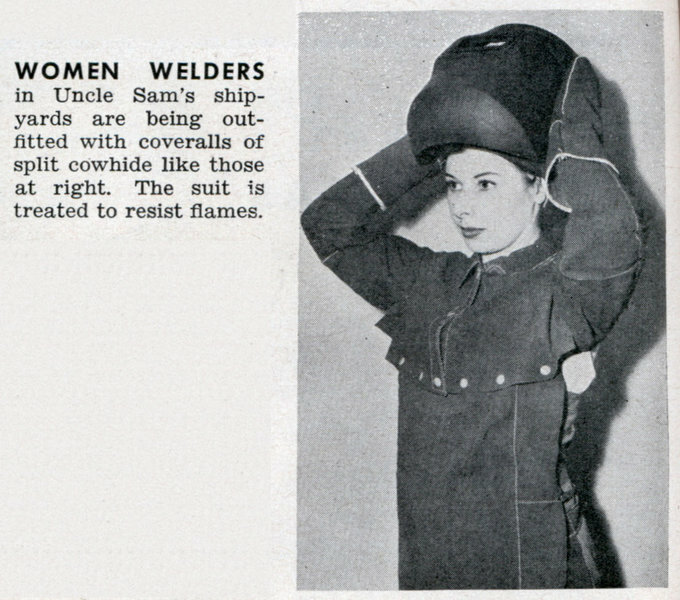 WOMEN WELDERS WOMEN WELDERS in Uncle Sam’s shipyards are being outfitted with coveralls of split cowhide like those at right. 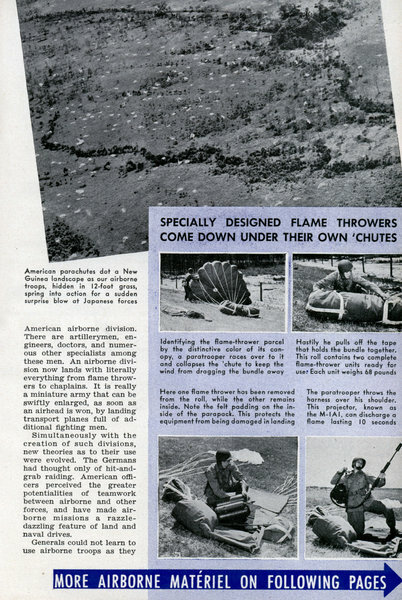 The suit is treated to resist flames. There is a definite I.C.S. type. 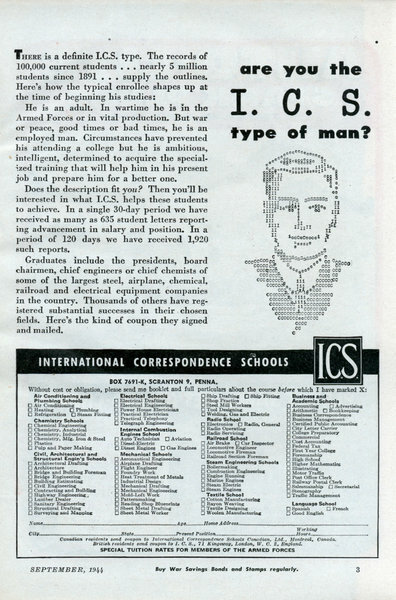 The records of 100,000 current students . . . nearly 5 million students since 1891 . . . supply the outlines. Here's how the typical enrollee shapes up at the time of beginning his studies: He is an adult. In wartime he is in the Armed Forces or in vital production. But war or peace, good times or bad times, he is an employed man. Circumstances have prevented his attending a college but he is ambitious, intelligent, determined to acquire the specialized training that will help him in his present job and prepare him for a better one. 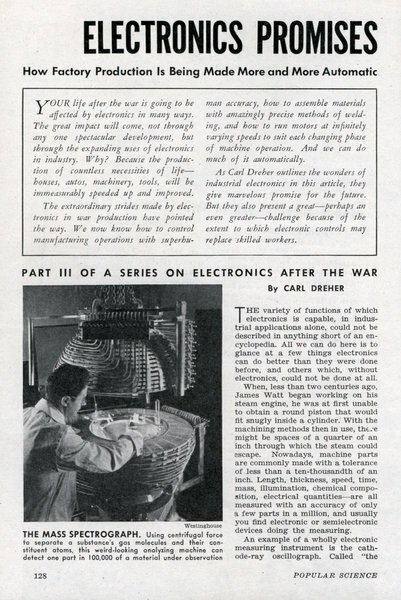 How Factory Production Is Being Made More and More Automatic by Amazingly Accurate Methods of Measurement and Control PART III OF A SERIES ON ELECTRONICS AFTER THE WAR By CARL DREHER YOUR life after the war is going to be affected by electronics in many ways. The great impact will come, not through any one spectacular development, but through the expanding uses of electronics in industry. Why? Because the production of countless necessities of lifeâ€” houses, autos, machinery, tools, will be immeasurably speeded up and improved. 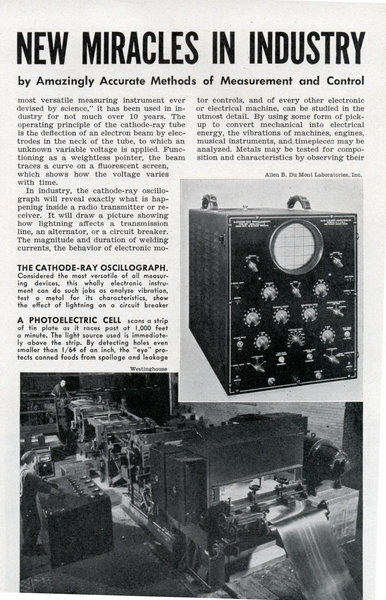 The extraordinary strides made by electronics in war production have pointed the way. We now know how to control manufacturing operations with superhuman accuracy, how to assemble materials with amazingly precise methods of welding, and how to run motors at infinitely varying speeds to suit each changing phase of machine operation. And we can do much of it automatically. You would enjoy a visit to Greenland. ... A land of unusual beauty and the midnight sun. The people there are friendly, pleasant and honest, awakening with ever-increasing speed to the features of the civilization we enjoy. . . . Greenland is a World Neighbor and the incidents that were once of only local importance are now of international concern. 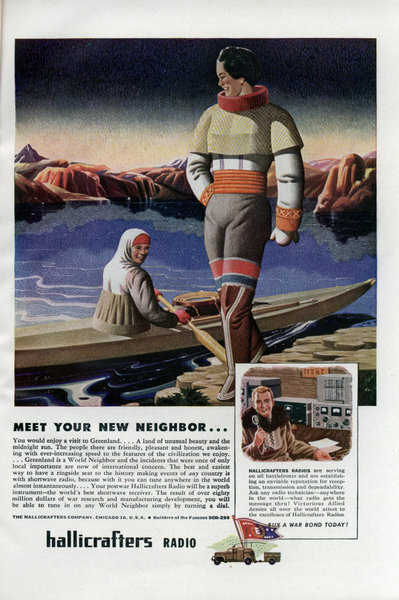 Can We Meet the Robot's Threat? 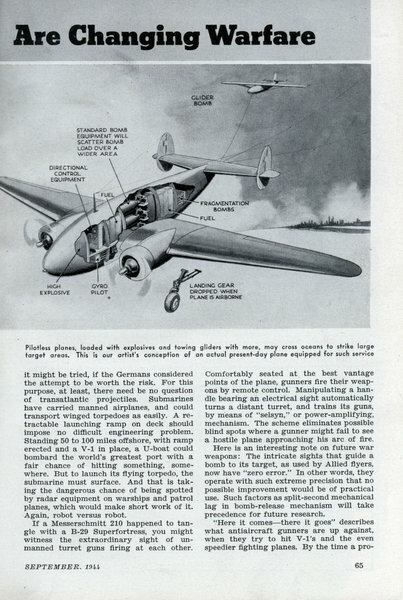 How Automatic Weapons Are Changing Warfare Crewless planes . . . mechanical brains that think faster than man . 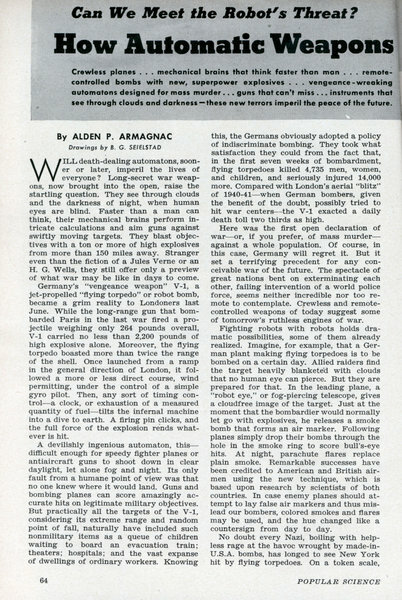 . . remote-controlled bombs with new, superpower explosives . . . vengeance-wreaking automatons designed for mass murder... guns that can't miss ... instruments that see through clouds and darkness â€”these new terrors imperil the peace of the future. By ALDEN P. ARMAGNAC Drawings by B. G. SEIELSTAD WILL death-dealing automatons, sooner or later, imperil the lives of everyone? Long-secret war weapons, now brought into the open, raise the startling question. They see through clouds and the darkness of night, when human eyes are blind. Faster than a man can think, their mechanical brains perform intricate calculations and aim guns against swiftly moving targets. They blast objectives with a ton or more of high explosives from more than 150 miles away. 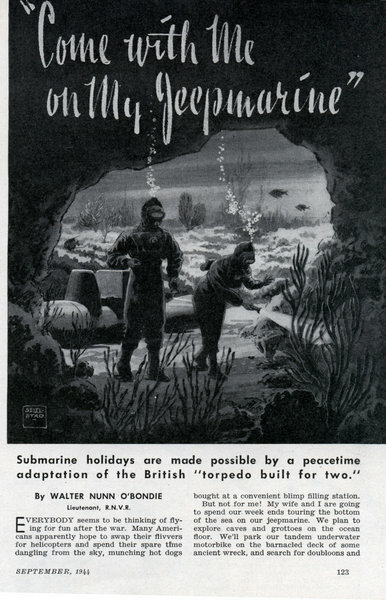 "Come with Me on My Jeepmarine"
Submarine holidays are made possible by a peacetime adaptation of the British "torpedo built for two" By WALTER NUNN O'BONDIE Lieutenant, R.N.V.R. 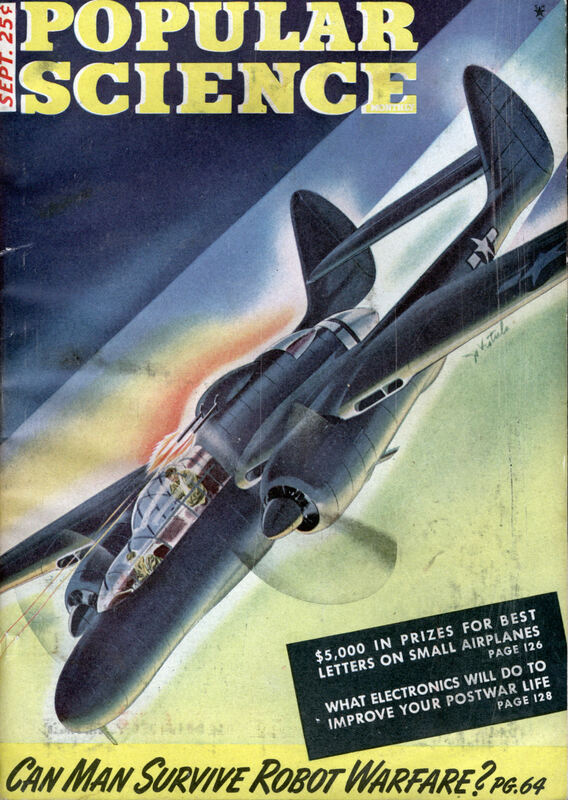 EVERYBODY seems to be thinking of flying for fun after the war. 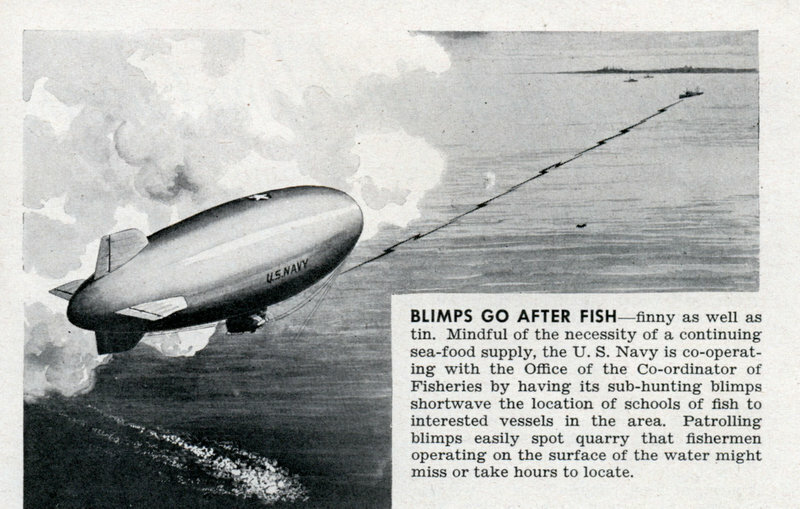 Many Americans apparently hope to swap their flivvers for helicopters and spend their spare time dangling from the sky, munching hot dogs bought at a convenient blimp filling station. But not for me! 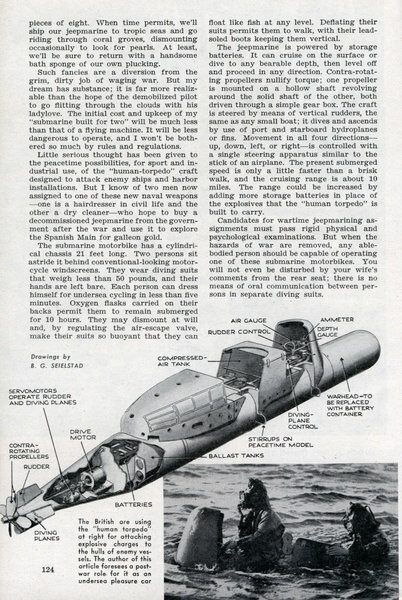 My wife and I are going to spend our week ends touring the bottom of the sea on our jeepmarine. We plan to explore caves and grottoes on the ocean floor. We'll park our tandem underwater motorbike on the barnacled deck of some ancient wreck, and search for doubloons and pieces of eight. When time permits, we'll ship our jeepmarine to tropic seas and go riding through coral groves, dismounting occasionally to look for pearls. At least, we'll be sure to return with a handsome bath sponge of our own plucking. Amazing new discoveries bring improvement to nature's masterpiece, enabling the busy little insect to do a better job for war. 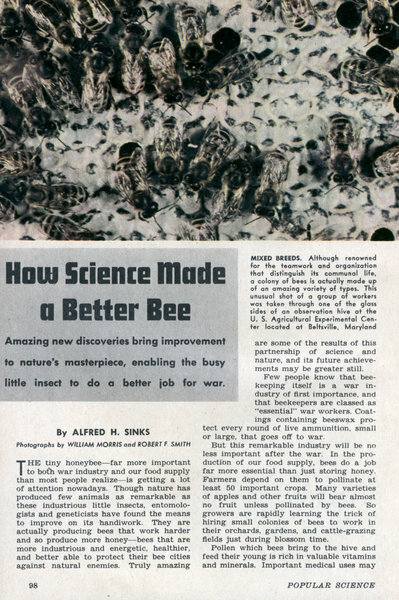 By ALFRED H. SINKS Photographs by WILLIAM MORRIS and ROBERT F SMITH THE tiny honeybeeâ€”far more important to both war industry and our food supply than most people realizeâ€”is getting a lot of attention nowadays. Though nature has produced few animals as remarkable as these industrious little insects, entomologists and geneticists have found the means to improve on its handiwork. They are actually producing bees that work harder and so produce more honeyâ€”bees that are more industrious and energetic, healthier, and better able to protect their bee cities against natural enemies. Truly amazing are some of the results of this partnership of science and nature, and its future achievements may be greater still. 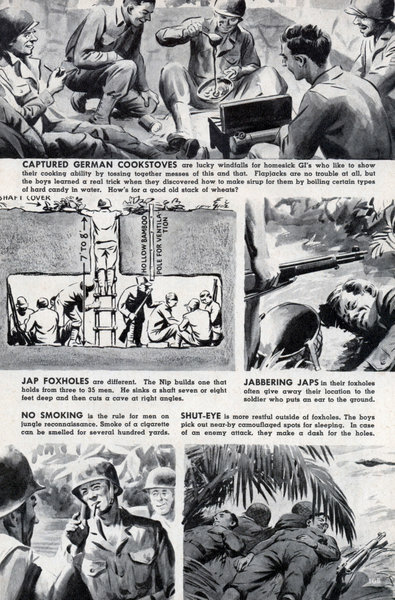 BORROWING IS TABOO among front-line soldiers who are emilyposted on Army etiquette. 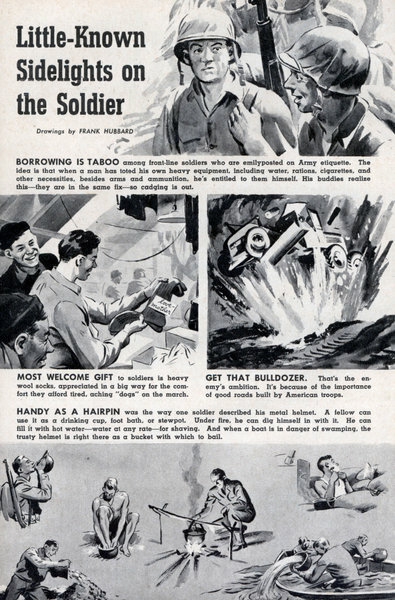 The idea is that when a man has toted his own heavy equipment, including water, rations, cigarettes, and other necessities, besides arms and ammunition, he's entitled to them himself. His buddies realize thisâ€”they are in the same fixâ€”so cadging is out. MOST WELCOME GIFT to soldiers is heavy wool socks, appreciated in a big way for the comfort they afford tired, aching "dogs" on the march. 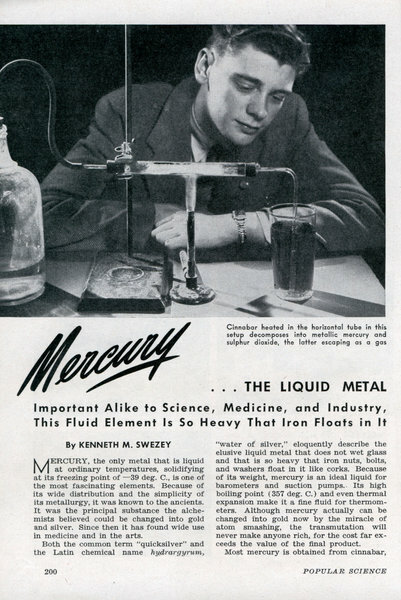 Important Alike to Science, Medicine, and Industry, This Fluid Element Is So Heavy That Iron Floats in It By KENNETH M. SWEZEY MERCURY, the only metal that is liquid at ordinary temperatures, solidifying at its freezing point of â€”39 deg. C, is one of the most fascinating elements. Because of its wide distribution and the simplicity of its metallurgy, it was known to the ancients. 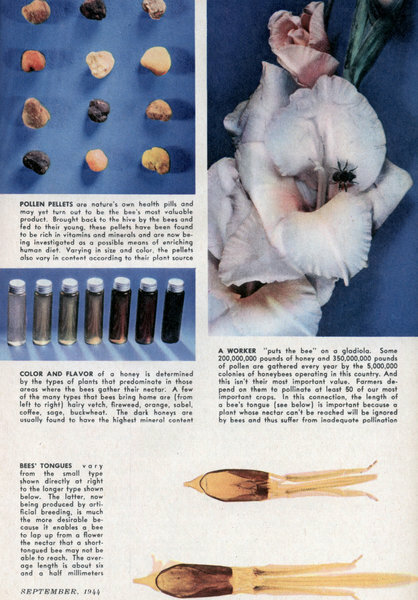 It was the principal substance the alchemists believed could be changed into gold and silver. Since then it has found wide use in medicine and in the arts. Both the common term "quicksilver" and the Latin chemical name hydrargyrum, "water of silver," eloquently describe the elusive liquid metal that does not wet glass and that is so heavy that iron nuts, bolts, and washers float in it like corks. 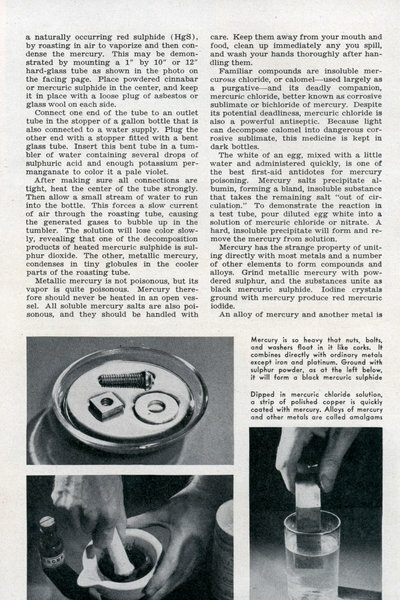 Because of its weight, mercury is an ideal liquid for barometers and suction pumps. Its high boiling point (357 deg. C.) and even thermal expansion make it a fine fluid for thermometers. Although mercury actually can be changed into gold now by the miracle of atom smashing, the transmutation will never make anyone rich, for the cost far exceeds the value of the final product. 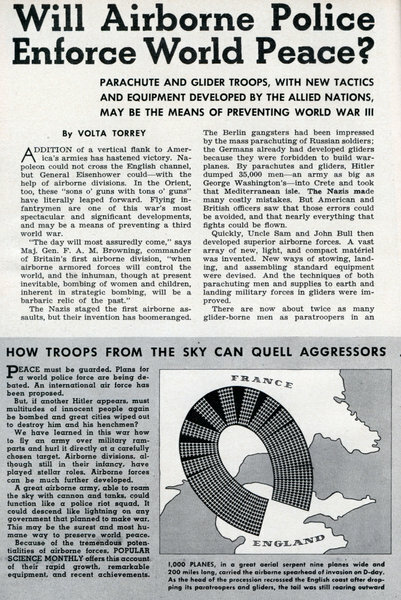 Will Airborne Police Enforce World Peace? What's My Job? - I Manufacture Weaklings into MEN! 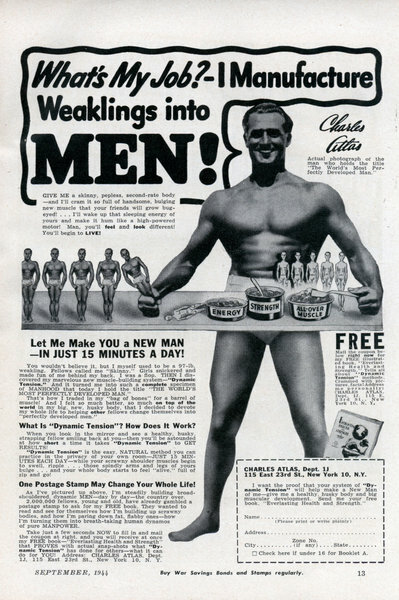 GIVE ME a skinny, pepless, second-rate body â€”and I'll cram it so full of handsome, bulging new muscle that your friends will grow bug-eyed! . . . I'll wake up that sleeping energy of yours and make it hum like a high-powered motor! 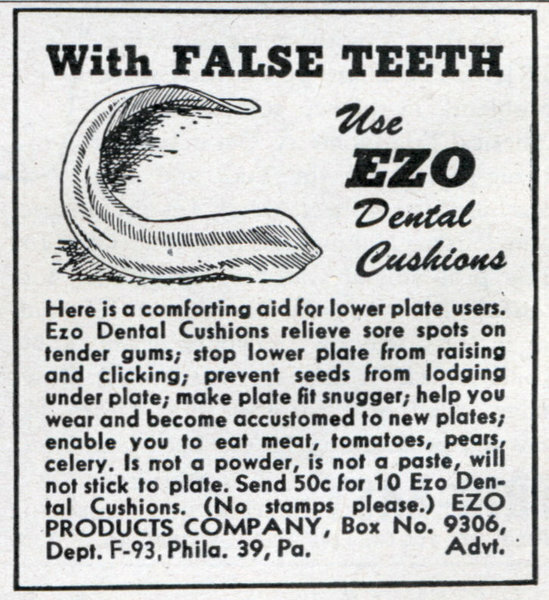 Man, you'll feel and look different! You'll begin to LIVE! 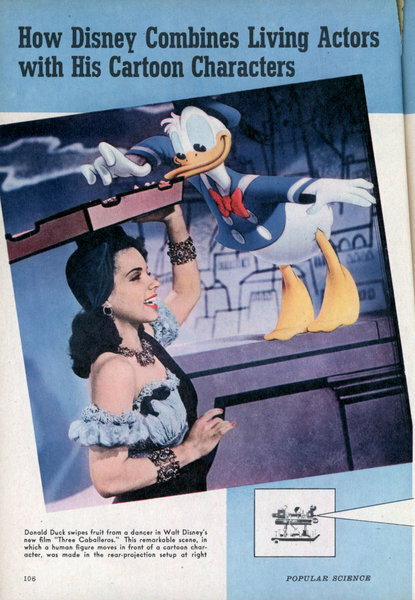 UP GOES another character in the Walt Disney Hall of Fame. Out comes another surprise from the Disney bag of tricks. 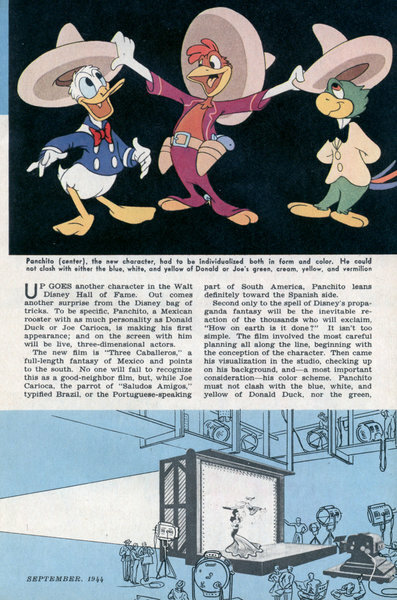 To be specific, Panchito, a Mexican rooster with as much personality as Donald Duck or Joe Carioca, is making his first appearance; and on the screen with him will be live, three-dimensional actors.